This umbrella was simply made by cutting an umbrella from construction paper and then allowing the children to golf ball paint the umbrella. 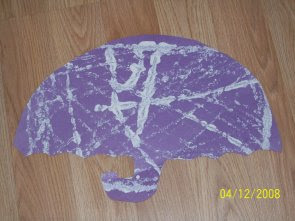 This was made a few years ago, but I'm sure we picked purple for the umbrella because purple was our color of the month. I think this umbrella looks a bit funny because it's handle is so short. One of the other teachers cut them out so that they would fit onto one piece of construction paper. You could make a smaller umbrella with a longer handle. Paint white raindrops with blue paint or blue rain drops with white paint. This golf ball painting idea can be used for many seasons. You can paint pumpkins for fall, ornaments for Christmas, heart for Valentine's Day, etc. Let children sort of stamp the paper using paint and cookie cutters, rather than golf ball painting. Use marbles instead of golf balls. ooohhhh I love the idea of using cookie cutters dipped in paint and using them to kind of stamp on the paper. My son had done the golf ball activity and he didn't like it as much. I think he likes to have more control of where the color goes. LOL Thanks again for the idea.